Added on December 27, 2016 by Renée Ricciardi. It was a pleasure to host my photography in an outdoor pop-up exhibition in Harvard Square. There was a film screening of A Beekeeper's Exploration, followed by a Q&A with filmmakers Brian Tortora & Daniela Goncalves of Bearwalk Cinema. Music was provided by Athena Desai and Mike Morrissey. 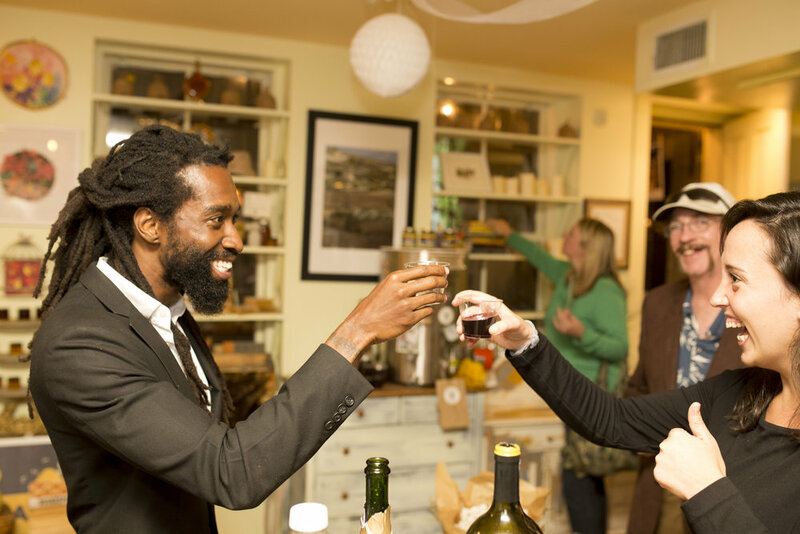 Thank you to our friends at Follow the Honey for hosting the event and making the night come alive! Added on November 28, 2016 by Renée Ricciardi. I'm happy to include 9 photo postcards in the Vermont Center for Photography's Postcard Exhibition. 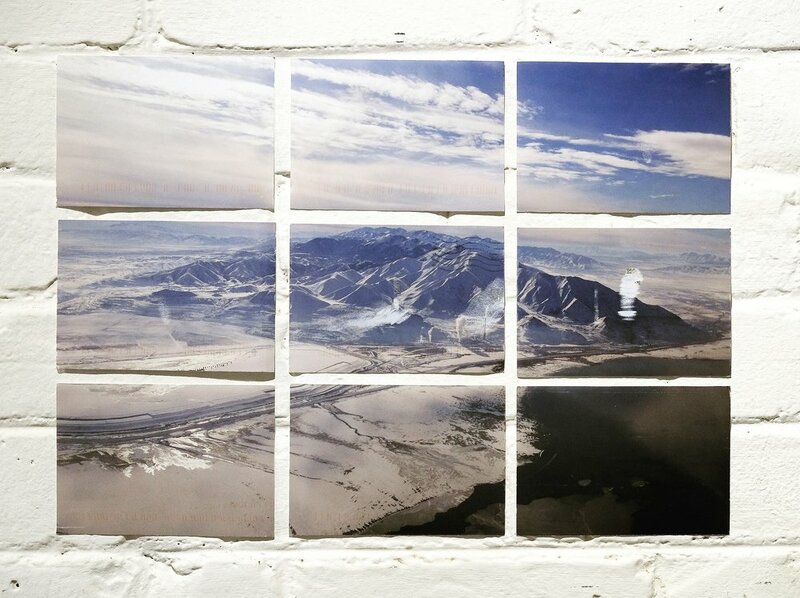 Photograph: Salt Lake City, 2016. Added on June 19, 2016 by Renée Ricciardi. Added on May 27, 2016 by Renée Ricciardi. I am thrilled to have my work on display in Boston's North End. Photos will be on display June and July at I Am Books, which is the only Italian-American bookstore in the United States. The opening reception will be an evening of art, food & honey, and Italian culture. Added on May 26, 2016 by Renée Ricciardi. Two of my photos are on view at one of my favorite radio stations, WBUR 90.9 FM Boston's NPR station. They are on view thanks to Fort Point Arts Community Art Lending Program and will be installed until the end of the year. Photograph On View at The Curated Fridge. Added on May 20, 2016 by Renée Ricciardi. Remember that feeling during the preschool days when your parents hung your artwork on the fridge? Well I get to be a kid again thanks to The Curated Fridge. One of my images, The Banana-Lemon Tree, is on view on the fridge from May to June. The show was curated by the talented duo Greer Muldowney and Matthew Gamber. Congrats to all the artists in the show! Added on February 28, 2016 by Renée Ricciardi. I had the tremendous pleasure of being the guest speaker at the Middlesex County Beekeepers Association. February 2016 - Renée Ricciardi speaking about her photographs. Added on February 12, 2016 by Renée Ricciardi. What does a gift say about a culture? How do gifts bring people closer? What happens when you pair 5 American artists with 5 Sicilian artists in remote town in Italy? The upcoming Regali exhibition at the Massachusetts College of Art showcases the stories behind some of the most precious gifts. Added on June 30, 2015 by Renée Ricciardi. In February, I was named one of Vermont Center of Photography's 30 under 30 Photographers. The exhibition was curated by Boston photographer and teacher, Greer Muldowney. The new July issue of Art New England Magazine features a write up about the work and exhibition. The article includes one of my photographs, called "Queen Anne's Lace" that was taken in the outskirts of Rome last year. Added on June 5, 2015 by Renée Ricciardi. How great it was to deliver a lecture in my hometown of Boston! I talked about all of my favorite things: art, science, photography, Italy, & bees! The talk was at Trident Books on Newbury Street and was part of the NerdNite Boston lecture series. It was great to talk about my photography and art, but even more rewarding was the opportunity to discuss the relationship art has with science. The two topics are seamlessly intertwined, and since the people in the audience primarily had science backgrounds, I was able to tap into the importance of blending art instead of separating it as a different category than science and math. Here I am, talking with my hands, per usual. Here is a flashback from when I delivered a talk for NerdNite Milan, in Italy! Added on May 30, 2015 by Renée Ricciardi. I was named one of Vermont Center of Photography's 30 under 30 Photographers. The exhibition was curated by Boston photographer and teacher, Greer Muldowney. Image on the left is called "Honey, Pollen, Wax" and was taken in Cefalu, Sicily in 2014. On the right is an photograph titled "Queen Anne's Lace." Rome, Italy. 2014. Both are 16 x 20 inches. Both images were printed in an small quantity of printed exhibition catalogues. Added on May 28, 2015 by Renée Ricciardi. I am very excited that Aint Bad Magazine approached me about featuring my work! As a long time reader of the magazine, it was an honor. Check out some of my new photos here. Apiary in Siracusa, Italy. 2014. Added on March 2, 2015 by Renée Ricciardi. I've gotten at least 5 emails everyday for the last week, all with the same message. "Check out the cool new Flow Hive!" It seems like the perfect product. Even I considered buying a few frames and outfitting my wooden hives to fit the new system. But the 'Flow' hive has been making me uneasy and I couldn't articulate why. Open the hive > remove honey filled frames > brush the bees from those frames >use a knife to remove the capping from the wax cells > and use a centrifuge that gets the honey out of the frame. It's an arduous process that takes hours, skill, and patience. The 'Flow' hive eliminates all of these steps and is less disruptive to the hive. It supplies fresh honey on tap. The purpose of it is to provide people with honey. Typical Honey Extraction in Centrifuge. But to me, that's not what beekeeping is about. These creatures work endlessly and should be respected for their production/pollination. The species Apis mellifera, or honeybee, has many toxic variables it's up against: Colony Collapse Disorder, Varroa mites, parasites, temperature shifts, pesticides, mice/bears/skunks, ventilation, poor nectar flows, birds, wasps, robbing from other colonies, disease. Does the beekeeper need to be an additional threat? Inside, I felt the flow hive was gimmicky, and is self centered for the new beekeeper. The relationship of bees to the keeper should be symbiotic. Also, the 'Flow' hive uses plastic frame foundation which is NOT in the bees best interest. Bees don't like having the size of each individual cell shape be man-made and have a predetermined size by a generic honeycomb shaped plastic mold. Plastic frames do not allow the bees to choose the size of each frame. Also, in colder climates, the plastic is less efficient for over wintering hives since there is less insulation than that pure, natural beeswax. How many new beekeepers buying this product know that? ...which adds to the convenience. If you're extracting honey from a hive you're not looking inside of, how do you know if you have a healthy, egg-laying queen? How do you know how much pollen/brood there is? How can you evaluate the health of your colony if you're blindly extracting honey whenever you want to add something sweet to your breakfast or to show off your new toy to your friends? You can't. In other words, it's the perfect invention for lazy, hungry honey-eaters who are also terrified of being stung. It will create a generation of oblivious people with bees who don't know the delicate mechanics of the beautiful hive. In 2011, I made a photographic body of work called Non Nobis by photographing beekeepers all over Massachusetts. The title is Latin for "we work but not for ourselves" and references the bee's enduring labor. The fruit of this labor, the bees never get to enjoy. Beekeeping involves respect, patience, and attention to the natural world. After years of beekeeping you become attentive to humidity every time you step outside, you start noticing which flowers bloom first, and last, you stop hating pesky dandelions, when it rains you think of the bees. You're suddenly attentive to the size and shape of new vegetation in your garden. In other words, beekeeping takes over how you think the planet functions. 8x10 Large Format Silver Gelatin Contact Print. 2011. The customers of this product know the bees are dying and it's excellent that it's becoming household knowledge that this problems exists. A movement to help the bees is exactly what we need - and what I have been working on for years. I recognize that if anything, the Flow hive is getting the word out that it;s time to #savethebees. But the "Flow's" long term benefits could be outlived when people get their new hive and realize that it's more that just a fancy automatic honey appliance. Words and Pictures by Renée Ricciardi. July Rain Storm. Rome, 2014. Renée Ricciardi is a Boston based artist, photographer, and naturalistic beekeeper. She received her Bachelors of Fine Arts in Photography from the Massachusetts College of Art. She spent six months living with beekeepers in 13 regions of Italy.Renée is currently working on a personal assignment photographing apiaries, beekeepers, and organic food in cities across Italy. Added on January 27, 2015 by Renée Ricciardi. It was an honor to delivered an hour long artist talk in Worcester, Massachusetts. I discussed this art project and my travels in great detail to a fully engaged audience of beekeepers! New Film with Bearwalk Cinema! Added on January 17, 2015 by Renée Ricciardi. Back in October I was approached by Brian and Daniela of Bearwalk Cinema. They proposed the idea of collaborating to make a film based on my love for photography, how nature influences my art, and my strong passion for beekeeping. It was truly an honor working with Bearwalk. If you like the film, follow them on twitter, facebook, and instagram. A Beekeepers Exploration from Bearwalk on Vimeo. Added on January 7, 2015 by Renée Ricciardi. It was an honor to speak about my current body of work at the Photographic Resource Center which is part of Boston University. I displayed some new prints that deal with Identity/Portraiture at the Nights at the PRC. “I had been wanting to talk about my photographs that deal with the concept of identity for a long time. The PRC offers an excellent platform for photographers to show their work and discuss it with a group of local artists. Added on November 4, 2014 by Renée Ricciardi. I had the pleasure of being interviewed by Beekeeper's Naturals, a Canada based blog and company. "So Renée, most 20 year olds are consumed with whose house party they can crash. What motivated you to take on beekeeping at the ripe age of 20?" "I know Italy is amazing and I love pizza as much as the next person but you’re from Boston, so why not focus on the bees there or somewhere closer to home? Why did you pick up your entire life and cross the Atlantic?" Needless to say, I had fun with this interview, read it to see my answers. The Bees in Italy Part II project was featured on Apis Cera in an interview about the project and my drive for creating it. It was exciting seeing my words and project translated into French. The photography, of course, speaks a universal language. Take a look at the English and French versions here, and to see all new photos. Added on July 2, 2014 by Renée Ricciardi. I had the honor of presenting my photography work to Fotoclub Padova. Article about my work and presentation in Padova, Italy.